In 1949, William Rex Crawford became the first Director of the Office for Foreign Students, an office designed “to help students from other lands in any way possible, but especially with academic problems.” He stated that the aim of the house wasn’t to compete with International House, and that he also hoped to assist students with plans for study abroad. His job also entailed aiding students with the information in the new Fulbright Act. Crawford was allotted two hours from teaching to run the Office for Foreign Students, along with one full-time secretary. Due to the communist revolution in China, the Chinese students at the University of Pennsylvania at this time feared returning home, and Crawford’s office spent a lot of time dealing with that issue. Later on, the Office for Foreign Students began to issue government documents required for student visas and aided American students who were hopeful to study abroad. In 1953, Dr. Crawford left for Salzburg, leaving his full-time secretary, Esther Leeds, in charge of the office. He returned one year later, but declined his old job, and E. Digby Baltzell became the new Director. Like his predecessor, Baltzell was a part-time Director with one full-time secretary. Because of the obvious time constraints, not much else other than the job Crawford had done could be accomplished for the approximately six hundred foreign students by the Office for Foreign Students during his leadership. In 1959, Dr. John F. Melby (pictured at the top of this page at Foreign Student Tea) became the first full-time Director. Unfortunately, he was also a faculty member, so he suffered time constraints as both Crawford and Baltzell had before him. Dr. Melby did, though, conduct a study on Foreign Students at the University of Pennsylvania. Jack D. Burke became the Director after Melby in 1963, and the Office for Foreign Students under his leadership created the first University orientation program for foreign students. Due to its evolving status, the name was changed from the Office for Foreign Students to the Office of International Services. Meanwhile, the campus line on studying abroad fluctuated. In the 1961 Report of the College’s Committee on Academic Programs Abroad, otherwise known as the Spiller Committee, the view was established that undergraduate study abroad should be discouraged. The Report stated that the programs “are not adequate substitutes in most cases for the equivalent time spent in the home college.” This was not to mention that the time spent going through the study abroad planning and approval process was long and tiresome. Curiously, though, one year prior to the report, the Thouron Fellowship was established as the largest British-American student exchange program to be run by a university in the United States, and in the same year as the report, an office was created to deal with information related to study abroad. This was the Office of Fellowship Information and Study Programs Abroad (OFISPA). Its purpose was to get information to students interested in study abroad, instead of discouraging them as the report had been encouraging that the college campus should do. It had been created based on a recommendation by a Committee of the Faculty from the College of Arts and Sciences. It was also to take care of related issues for graduate students and to maintain the administering of Thouron Fellows, Fulbright applicants and Rhodes scholars as well as some others. 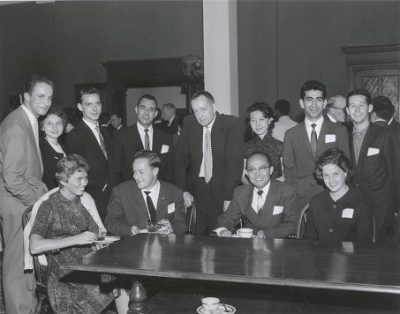 A year later, in 1962, the Penn-Pahlavi program was initiated which included faculty exchanges and the opportunity for undergraduates to study abroad. Unfortunately, there was no program at Penn which could encourage students to think of study abroad as integral to their academic progress, and in this way, the 1961 report succeeded in its goals. Ten years later, though, the official attitude would drastically change.